This is the first article in a series on the MINERνA neutrino experiment. A new Fermilab experiment, MINERνA, is joining the effort to answer one of the most puzzling questions of physics: What are neutrinos trying to tell us, about themselves, matter and about the universe? "There are more neutrinos in the universe than there are protons and neutrons by a huge factor," says experiment co-spokesperson Kevin McFarland of the University of Rochester. "And yet they are one of the least understood of particles. We didn't even know if they had mass until the last decade, and we have years of experimentation ahead of us to fully understand the nature of the neutrino." 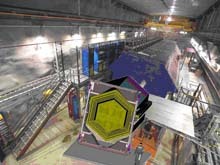 MINERνA (Main Injector Neutrino ExpeRiment v-A), which is currently in the prototyping phase, will use a comparatively small (5 tons), high-resolution detector placed in the NuMI near target hall. With the NuMI beam firing neutrinos at it point-blank, MINERνA positions itself at the juncture of particle and nuclear physics. 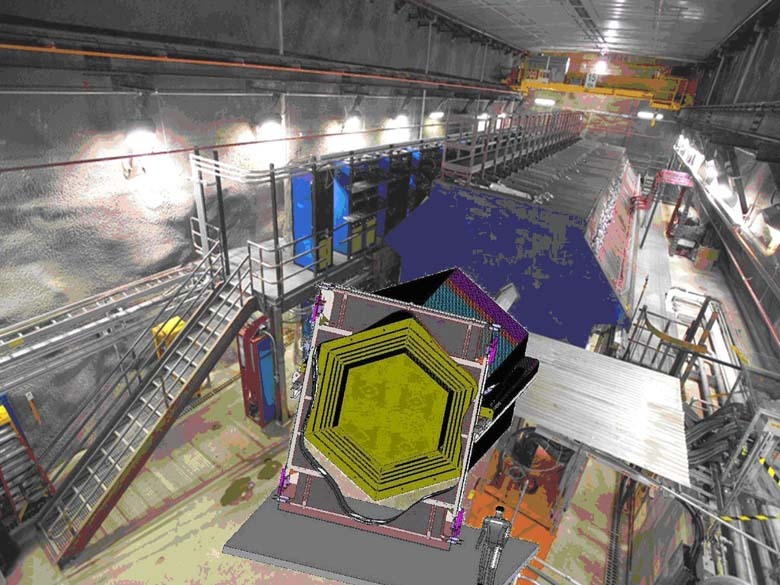 The experiment, the first of its kind, will use the high intensity of the NuMI beam to study neutrino reactions with the nuclei of three target materials: carbon, iron and lead. Neutrinos rarely interact with matter. But given the intensity of the NuMI beam, and the sheer numbers of neutrinos in the NuMI Near Hall, MINERνA can collect millions of events in just a few years of running. The 19-institution collaboration includes several nuclear physicists who want to study both the initial collisions and the results of the particles that are produced as they pass through the nuclei of the detector atoms. "We can't understand the nature of neutrinos if we don't know how they interact in our detectors," says co-spokesperson Jorge G. Morfin of Fermilab. "We can use neutrinos to study supernovae, the sun, even the core of the earth-but only if we understand the nature of the neutrinos themselves, and how they interact with matter"
Robert and Jane Wilson in 1978. 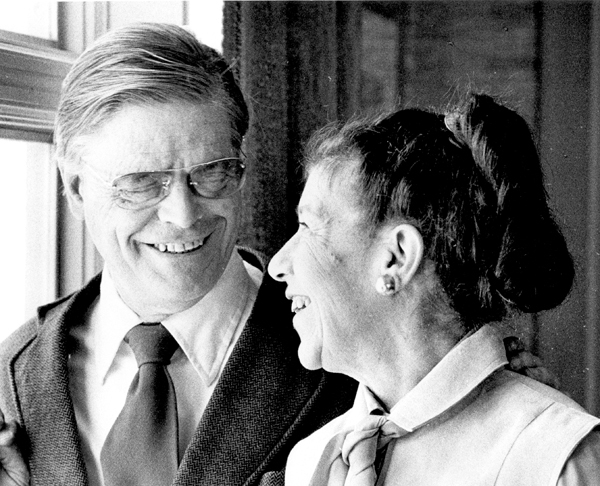 Jane Scheyer Wilson, 89, widow of Fermilab's founding director Robert R. Wilson, died yesterday morning, February 14. She is survived by three sons, Daniel, Jonathan, and Rand and their families. A memorial service at the "Kendal in Ithaca" (NY) will be held approximately a month from now. Details are not yet available. Final burial will be in the Pioneer Cemetery at Fermilab, where Dr. Wilson is buried, at a later date. A remembrance will appear soon in Fermilab Today. Upton, NY and Batavia, IL - A global collaboration of physicists and computer scientists announced today the successful completion of a test of the first truly worldwide grid computing infrastructure. Researchers from two national laboratories and ten universities across the United States participated in the test, which saw data transferred around the world at a rate of up to one gigabyte per second. Today's scientific discoveries in many fields, including particle physics, require massive amounts of data and the dedication of thousands of researchers. Grid computing transforms the way such scientists plan and conduct research. The current test is a crucial step on the way to making data from the Large Hadron Collider, the world's largest scientific instrument, available to scientists worldwide when the accelerator begins operating in 2007 at CERN in Geneva, Switzerland. In the current months-long test, or "service challenge," data were transferred from CERN to 12 major computing centers around the globe, including Brookhaven National Laboratory and Fermi National Accelerator Laboratory, and to more than 20 other computing facilities, ten of which are located at U.S. universities. The Hadron Collider Physics Summer School will run in August at Fermilab. The organizing committee includes physicists from Fermilab, Brown University and UC Davis. The 2006 Hadron Collider Physics Summer School, held at Fermilab August 9-18 as the first in a joint CERN-Fermilab series, is now accepting applications from advanced graduate students and recent PhD's. If you would like more information, or would like to apply, visit the HPC Summer School Website. So far more than 50 percent of Fermilab employees have filled in and submitted the Fermilab Today survey conducted by the University of Chicago Survey Lab. Thank you. The Survey Lab will close the online survey this Friday, February 17. If you have not yet completed the survey, please take 10 to 15 minutes of your time to answer the questions. Click on the link provided in the email from Kelly Daley of the Survey Lab. (If clicking doesn't work, please copy the entire link as one line into a Web browser.) We'd like to get feedback from as many lab employees as possible! Discounted Tickets to "String Theory" by The Chicago Chamber Musicians The concert will take place Sunday, February 19 at 7:30 p.m. at the Pick-Staiger Hall in Evanston and Monday, February 20 at 7:30 p.m. in the DePaul University Concert Hall in Chicago. The cost is $15 for physicists and physics educators and $10 for students with a valid ID. For tickets, call 312-225-5226 and mention the code words: "super-symmetry" to access the discount. The Fermilab Association of Rocketry is having their monthly club meeting on February 15 at 5pm in the Users Center TV room. We are always looking for new members, so anyone interested in model rocketry is most welcome. Fermilab Folk Club Barn Dance Sunday, Feb. 19 at 2 p.m. with music by the Sundogs and calling by Paul Tyler. Classes are added weekly. To see the most recent schedule, visit the Office for Professional and Organizational Development website.